Give yourself a refreshing scalp treatment and shampoo in one! This clarifying shampoo contains 2.3% peppermint extract plus 16 pure plant extracts and 11 carrier and essential oils, leaving your hair smooth, silky and clean. Restores body and adds volume, too. Shake well. Wet hair, apply shampoo to your scalp, and massage in with the pads of your finger tips. Let sit for 1-3 minutes. Work lather into your hairshaft through the ends in a downward motion. Rinse well. Repeat if desired. 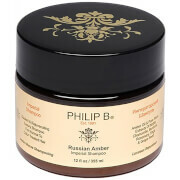 Follow with Philip B® Deep Conditioning Creme Rinse and Philip B Detangling Finishing Rinse. The peppermint is very refreshing for morning or everytime that I have a headache. It really takes out the stress out of daily life when I wash my hair with this shampoo and give myself little bit head massage along with it. However, other than that I don't see any other benefits coming along with it.